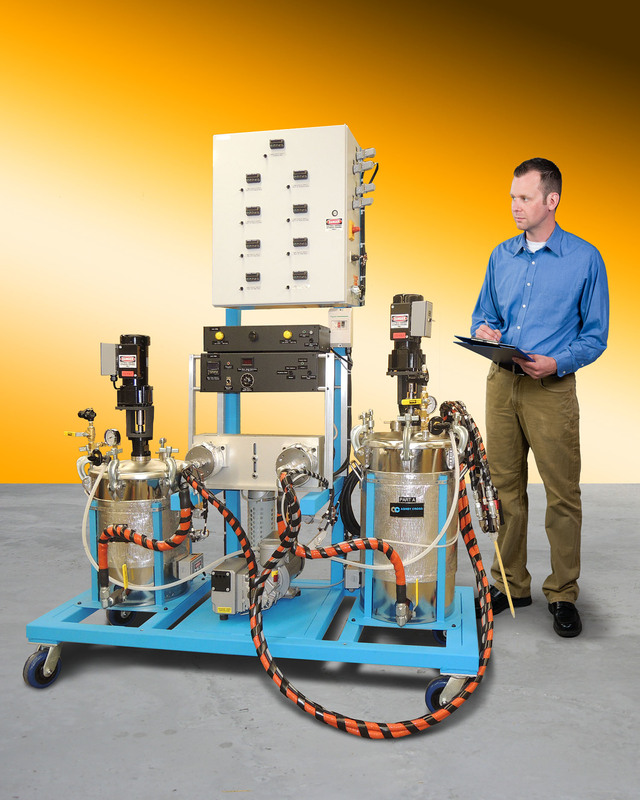 A urethane processing system that accurately proportions, mixes, and dispenses urethane for applications such as cable end sealing and splicing, connector sealing, bulkhead pass-thru, creating gaskets and seals, potting, and encapsulating is available from Ashby Cross Company of Newburyport, Massachusetts. The Ashby Cross GP80 Urethane Processing System accurately dispenses high- purity, two-part urethanes and ensures material integrity by using a thermal management system that provides heating by zones with thermocouple sensing and proportional control; permitting a custom thermal profile throughout. Providing 100:100 to 100:6 adjustable ratios by volume with ± 1% accuracy, is has a drip-free dispense head for continuous or intermittent shots. Offering adjustable flow rates up to 2 lpm, standard features for the Ashby Cross GP80 Urethane Processing System include heated and agitated material tanks with vacuum capability and optional nitrogen connections, heated hoses and mix/dispense valves, and stainless steel gear pumps; all packaged on a mobile cart. Options include shot size control, on-board vacuum pump, up to 80 gal. tanks, pot-life timer, reservoir sensing, and bulk feed capability. The Ashby Cross GP80 Urethane Processing System is priced from $39,995.00.